Coal-fired power plants produce about 62 percent of the electricity generated in North Carolina. 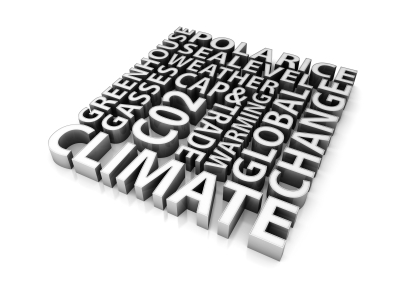 The U.S. Environmental Protection Agency (EPA) projects this amount to be 67 percent by 2010. North Carolina produces a disproportionately large amount of carbon dioxide, in large part because of the state’s numerous coal plants, and ranks 14th in the nation in CO2 emissions. The state produces 77 million tons of CO2 every year, an amount only slightly less than California’s 79 million tons, despite the fact that North Carolina’s population is one quarter the size of California. North Carolina-based Duke Energy is planning an 800MW expansion at its Cliffside plant that would emit an additional 6.25 million tons of CO2 per year. Duke Energy is the nation’s third largest producer of carbon dioxide, emitting 108 million tons of CO2 per year, despite CEO Jim Rogers’ public calls for federal legislation to reduce greenhouse gas emissions. Duke’s eight plants in North Carolina produce 41 million tons of CO2 each year, more than half of the state’s total yearly carbon dioxide emissions. In May 2010 the Union of Concerned Scientists released a report titled, Burning Coal, Burning Cash: Ranking the States that Import the Most Coal. In the paper the group reported that North Carolina was the second most coal dependent state in the country, spending $2.3 billion on coal imports in 2008. North Carolina has no active coal mines, so all coal is imported from out of state. The only place in the state known to contain potentially useful coal beds is the Deep River coal field in Chatham County. The coal beds cover an area approximately 35 miles long and 5 to 10 miles wide and are estimated to contain over 110 million tons of coal, but the topography and geology of the area make retrieval difficult. Historically the Deep River coal field was mined beginning in 1852 at the Egypt Mine, and expanding in the late 1860s as a result of the Civil War. In 1925 a series of explosions killed 53 workers at the Coal Glen mine, in what remains North Carolina’s worst workplace accident. The accident led to the passage of North Carolina's Workers' Compensation Act in 1929. Coal production ceased in 1953, in part because the coal seam is too deeply buried and broken by multiple faults, making retrieval both difficult and expensive. On August 13, 2007, 150 activists occupied a Bank of America branch in Asheville, North Carolina. The protestors condemned Bank of America's ongoing funding of mountaintop removal mining in Appalachia. Two people locked themselves to the main lobby, while others blockaded the entrance to the branch, and delivered coal to the bank's managers. Five people were arrested. On October 23, four activists with Rainforest Action Network, scaled a 15-story crane across the street from Bank of America's corporate headquarters in downtown Charlotte. Reading "Bank of America:Funding Coal, Killing Communities," the action was a protest against the bank's funding of mountaintop removal and new coal plant development. The banner hang disrupted traffic for several blocks until police and firefighters brought down the activists. All four were arrested. On April 1, 2008, a group of North Carolina activists locked themselves to bulldozers to protest the construction of the Cliffside coal-fired power plant in western North Carolina. Others roped off the site with "Global Warming Crime Scene" tape, and held banners protesting the construction of the plant. Police used pain compliance holds and tasers to force the activists to unlock themselves from the construction equipment. Eight people were arrested. 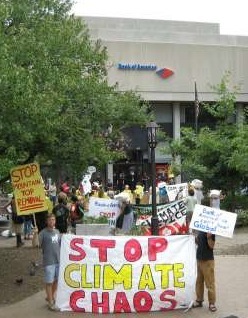 On June 26, 2008, activists from Rainforest Action Network demonstrated outside Bank of America's Charlotte headquarters, carrying a banner that read "Divest from Coal!" The group distributed fliers on the bank's investments in the coal industry to employees and local residents. Police were on hand, but no one was arrested. Two protesters locked themselves to a 1.5 million pound generator being delivered to the Cliffside Plant in North Carolina. The activists vowed to prevent the generator from reaching the Duke Energy plant. Protesters also displayed a large banner reading "Stop Cliffside" from the top of the generator. More than 20 activists attended the protest; four were arrested. The action was organized by Asheville Rising Tide and Croatan Earth First! as part of a national day of action with dozens of protests planned around the U.S. Activists block tracks bringing mountaintop removal coal to Marshall Steam Plant. On May 3, activists protested mountaintop removal mining by locking themselves to train tracks, preventing coal train loads from entering Duke Energy's Marshall Steam Station in North Carolina. The activists, affiliated with RAMPS, Katuah Earth First!, Greenpeace and Mountain Keepers said they would not leave until Duke agreed to end its use of mountaintop removal coal operations. The power burned in Marshall is used to power Apple's iCloud data center. Four activists handcuffed themselves to tracks, while others draped banners with Apple's logo on freight cars. Four activists handcuffed themselves to tracks, while others draped banners with Apple's logo on freight cars. North Carolina generates over 5.5 million tons of ash per year, ranking 9th in the nation for coal ash generation. There are 26 ponds at 14 plants, and two retired ponds at the Cliffside Plant in Mooresboro. Twelve ponds in North Carolina have been rated “high hazard”, and six have been rated as “significant hazard” by EPA. A significant hazard ranking indicates that a failure at the pond can cause economic loss, environmental damage, or damage to infrastructure. If high hazard ponds fail, they will probably cause a loss of human life. Ash ponds constructed before 1994 (at least 22 of North Carolina’s 26 ash ponds) are not required to have caps, liners, or conduct groundwater monitoring. Until 2009, ash pond dams were also exempted from any dam safety inspection under the North Carolina Dam Safety Act of 1967. Monitoring at coal ash landfills is discretionary, not mandatory, and landfills are not required to conduct on‐site groundwater monitoring after closure. Ash" by Earthjustice and Appalachian Mountain Advocates, looked at EPA data and found that state regulations are often inadequate for protecting public health. North Carolina has enough coal ash to flood an area the size of the UNC Raleigh campus 32 feet high, yet does not require groundwater monitoring of the sites. Following the TVA Kingston Fossil Plant coal ash spill in Tennessee, N.C. state Rep. Pricey Harrison (D-Guilford) introduced H1354 in 2009, to change the way coal ash is regulated in the state, including creation of a permitting system for coal ash structural fills. However, the final version of the legislation that passed the General Assembly had the structural fill provision stripped out. Instead, the measure subjected the state's coal ash impoundments to dam safety rules, an approach aimed at preventing catastrophes like Kingston but that does not address environmental contamination from ash fills. In 2009, state regulators visited 48 coal ash sites, and found violations at 28 of them, ranging from water contamination to a lack of cover that could stop coal ash from escaping fill sites. Regardless, Gov. Perdue, the departments of Transportation and Commerce, and the state's Utility Commission are all on record opposing federal regulation of coal ash as hazardous waste. According to the 2010 report "Unlined Landfills? : The Story of Coal Ash Waste in our Backyard" by the Sierra Club North Carolina, companies using dry coal ash as fill - for publicly used land and even farmland for growing food crops - are supposed to record the presence of the ash on the property deed under North Carolina law (a provision fought by Duke Energy), yet only 56 percent of such uses complied with this requirement. State officials aren't required to do their own tests of coal ash fill to see if it has potentially dangerous levels of arsenic and other contaminants. It is left up to the companies, and there are no rules to check the accuracy of what the companies report. Further, no advance permits are required for fills, and while the state can comment on a company's coal ash fill plans, it does not have the power to deny them. In response, the report advocates: 1) discontinuing the practice of allowing coal ash to be used for land development and instead dispose of it in landfills that comply with state regulations requiring liners and other precautions to prevent pollutants from leaching into ground or surface water; 2) publicly available groundwater monitoring at existing active structural fill sites for at least 30 years after a structural fill is closed; 3) requiring cleanup by developers if monitoring data reveal that groundwater or surface water has been contaminated by coal ash; 4) identifying a funding source to enable adequate regulatory oversight and enforcement of closed sites; and 5) requiring that the use of coal ash as structural fill be permanently recorded on the deed for the affected property. In response to demands from environmentalists as well as Senator Barbara Boxer (D-California), chair of the Senate Committee on the Environment and Public Works, the EPA made public a list of 44 "high hazard potential" coal waste dumps. The rating applies to sites at which a dam failure would most likely cause loss of human life, but does not include an assessment of the likelihood of such an event. 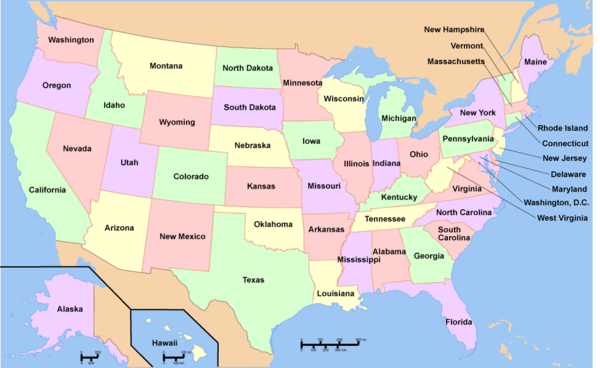 North Carolina has 12 of the sites, more than any other state. 10 of the sites belong to Duke Energy. In October 2009, Appalachian Voices released an analysis of monitoring data from coal waste ponds at 13 coal plants in N.C. The study revealed that all of them are contaminating ground water with toxic pollutants, in some cases with over 350 times the allowable levels according to state standards. The contaminants include the toxic metals arsenic, cadmium, chromium, and lead, which can cause cancer and neurological disorders. The study was based on data submitted by Duke Energy and Progress Energy to state regulators. The North Carolina Department of Environment and Natural Resources is attempting to confirm the results before determining whether current state law can mandate corrective action. Researchers in North Carolina have also found that solid waste facilities were 2.8 times more likely to be located in communities with 50 percent or more non-white residents, versus communities with less than 10 percent of residents being people of color, and are negatively impacting the health of these communities, raising issues around environmental justice and coal. In August 2010 a study released by the Environmental Integrity Project, the Sierra Club and Earthjustice reported that North Carolina, along with 34 states, had significant groundwater contamination from coal ash that is not currently regulated by the Environmental Protection Agency (EPA). The report, in an attempt to pressure the EPA to regulate coal ash, noted that most states do not monitor drinking water contamination levels near waste disposal sites. The report mentioned North Carolina based Dan River Steam Station as having groundwater contamination due to coal ash waste. 1. Hyco Lake, Roxboro. Hyco Lake was constructed in 1964 as a cooling water source for the CP&L Roxboro Steam Plant. The lake received discharges from the plant’s ash-settling ponds containing high levels of selenium. The selenium accumulated in the fish in the lake, affecting reproduction and causing declines in fish populations in the late 1970s and 1980s. The NC Department of Health and Human Services issued a fish consumption advisory in 1988. 2. Belews Lake. Impounded in the 1970s as a cooling reservoir. Fly ash produced by the power plant was disposed in a settling basin, which released selenium-laden effluent to the lake. Due to the selenium contamination, 16 of the 20 fish species present in the reservoir were entirely eliminated, including all the primary sport fish. Selenium discharge from the plant and fish impacts persisted from 1974 to 1985. In 1985, under a mandate from NC, the plant stopped the discharge. Bioaccumulation of Se has been found in birds visiting the lake. 3. Duke Energy G.G. Allen Steam Plant. According to 1985 data, EPA noted exceedances of manganese and iron in wells downstream from the coal ash disposal site. 4. Progress Energy Sutton Steam Plant. Levels of arsenic, boron, manganese, and iron exceed NC groundwater standards underneath the coal ash impoundment. Arsenic concentrations have been measured as high as 29 times the federal drinking water standard. 5. Progress Energy Lee Steam Plant: Levels of arsenic, lead, boron, manganese and iron exceed NC groundwater standards onsite. Arsenic concentrations have been measured as high as 44 times the federal drinking water standard. 6. Progress Energy Cape Fear Steam Plant: Levels of lead, chromium, boron, iron, manganese and sulfate exceed NC groundwater standards. 7. Progress Energy, Asheville Plant. Levels of chromium, boron, iron, and manganese exceed NC groundwater standards in groundwater underneath and downgradient of the plant’s coal ash impoundment. Airborne ash, containing arsenic, from the disposal site is a serious problem to the surrounding community. 8. Duke Energy, Belews Creek Steam Station. Leaching coal ash landfills have contaminated underlying groundwater above NC standards with arsenic, cadmium, selenium and nitrate and are polluting surface water. 9. Full Circle Solutions, Inc.’s Swift Creek Structural Fill. Arsenic, barium, lead, mercury and sulfate exceed NC groundwater standards and federal drinking water standards. 10. Duke Energy Dan River Steam Station. Levels of chromium, iron, lead, manganese, silver and sulfate exceed NC groundwater standards and federal drinking water standards. A report released by EarthJustice and the Sierra Club in early February 2011 stated that there are many health threats associated with a toxic cancer-causing chemical found in coal ash waste called hexavalent chromium. The report specifically cited 29 sites in 17 states where the contamination was found. The information was gathered from existing EPA data on coal ash and included locations in Alabama, Arkansas, Delaware, Florida, Illinois, Indiana, Minnesota, Massachusetts, North Carolina, North Dakota, Nevada, Ohio, Oklahoma, Pennsylvania, Tennessee, Virgina and Wisconsin. In North Carolina, the Dan River Steam Station in Eden, the Asheville Plant in Asheville and the Cape Fear Steam Plant in Montcure all were reported as having high levels of chromium seeping into groundwater. A 2011 Union of Concerned Scientists report, "Freshwater Use by U.S. Power Plants: Electricity’s Thirst for a Precious Resource," calculated the available water in every major watershed in the U.S. and measured that against the water used by power plants in each watershed. The report found that water supply in North Carolina's Upper Catawba and South Fork Catawba is stressed by power plants (coal and nuclear) that together withdraw 1 to 3 trillion gallons of water per year, and consume between 5 and 19 billion gallons. A study by Duke Energy found the Catawba water supply would not meet demand by 2048. The plants on the Catawba also are stressing the river by discharging cooling water at temperatures far too high for fish and wildlife to survive. Many local officials are unhappy with the proposal. For instance, the City Durham NC noted its opposition to the rate increases in comments to the NCUC. "Is a return on investment of 11.3 percent necessary or even appropriate in this economy?" the city asked, referring to Duke's guaranteed 11.3 percent rate of return, which would be an increase from the current 10.7 percent. In March 2009, Duke Energy Carolinas proposed a 5 percent increase on its power charges in North Carolina, to compensate the company for higher coal prices. The fuel-charge increase is separate from an upcoming Duke proposal for a general rate hike. The company estimates that the average customer bill would increase from approximately $87 per month to about $91 per month. Similar increases will be proposed in South Carolina in summer 2009. In September 2009, the North Carolina Utilities Commission held a public hearing on Duke's proposed rate increase of 12.6 percent for its North Carolina customers. Duke says the increases are necessary to recoup $4.8 billion in capital spending, which includes the amount spent to date on the Cliffside expansion. The utility commission's Public Staff, which represents utility customers, is opposed to the increase, describing it as unjustified. About two dozen people spoke at the hearing, most of whom were residents opposed to the rate hike and to the new Cliffside plant. The commission is scheduled to begin hearing expert testimony on Duke's rate hike request ion October 19. A 2010 investigation by the Institute for Southern Studies found that North Carolina businessman Art Pope was funneling money to ostensibly nonpartisan nonprofits that use it to run attack ads, primarily directed at NC politicians who have played a key role in addressing climate change in the state. Facing South's analysis of tax return data found that Art Pope's family foundation, the Pope Foundation, had made large contributions to the same network of groups denying climate change as the Koch Brothers from 1997 to 2008 -- more than $24.1 million in all. Many of the funds went to the John Locke Foundation, a 501(c)(3) nonprofit think tank based in Raleigh, N.C. that was created in 1990 to promote the idea of limited government. Pope provides 80 percent of the organization's funding -- $16.9 million from 1997 to 2008 -- and sits on its board of directors. The John Locke Foundation has been one of the most outspoken voices of climate denial, particularly in North Carolina - in 2007, North Carolina passed Senate Bill 3 to adopt a minimum requirement for the use of renewable energy sources by investor-owned electric utilities. The bill requires that 12.5 percent of all electricity sold in the state by 2020 must come from renewable sources or improved efficiency. The John Locke Foundation would like to do away with it altogether, according to the group's 2010 climate agenda. Pope's foundation is also a backer of the Civitas Institute, a 501(c)(3) nonprofit, and its 501(c)(4) sister group, Civitas Action. Between 2005 and 2009, the Pope Foundation has accounted for about 99 percent of the Civitas Institute's foundation income. Civitas Action spent $5,750 on mailers targeting North Carolina House Speaker Joe Hackney and Senate leader Marc Basnight, Democrats who have been supportive of efforts to address global warming. Running against 15-term Hackney is Cathy Wright, a nursing instructor who's also worked as a lobbyist for medical groups. Her campaign manager did not respond to Facing South's request for information about her position on climate change. But Wright does say she's a member of the Conservative Womens Forum, which promotes a book calling global warming a "scam" and is critical of clean energy solutions from cap-and trade legislation to wind power to the promotion of compact-fluorescent light bulbs. Additionally, her campaign website links directly to both the John Locke Foundation and the Civitas Institute. Basnight's opponent is Hood Richardson, a retired minerals geologist and commissioner for Beaufort County, N.C. Richardson calls global warming a "problem that has since been debunked as based on faulty science." He also criticizes Basnight for helping create the state climate change commission, saying it will "severely harm businesses" and cites the John Locke Foundation for his assertions. On January 9, 2011, Duke Energy said it agreed to buy Progress Energy for $13.7 billion in stock, creating the largest U.S. power company if it wins approval from regulators in North and South Carolina. The transaction would create an industry giant with approximately 7.1 million electricity customers in North Carolina, South Carolina, Florida, Indiana, Kentucky and Ohio, and 57,000 megawatts of generating capacity. State regulators have sought concessions from large power companies planning to merge, such as rate reductions. If the deal is approved by regulators, the combined companies would form the single largest utility in the United States. North Carolina has 67 operating coal-fired power units at 25 locations totaling 13,279 megawatts (MW). The following 15 power plants are 240 MW or larger. On January 13, 2009, in North Carolina ex rel. Cooper v. Tennessee Valley Authority (W.D. N.C. Jan. 13, 2009), North Carolina District Judge Lacy Thornburg declared that air emissions from three coal-fired plants located in eastern Tennessee and one plant located in Alabama, all operated by the Tennessee Valley Authority, are a public nuisance under state law. On July 26th, 2010, the Fourth Circuit Court of Appeals dismissed the lawsuit, setting aside an injunction that would have required the installation of more than a billion dollars worth of emissions control technologies at four TVA plants in Alabama and Tennessee. The suit was settled April 14, 2011, when the "Tennessee Valley Authority" agreed to shut down 18 coal fired power plants. A consent decree entered June 30 by the US District Court for the Eastern District of Tennesse required TVA to invest an estimated $3 billion to $5 billion in pollution controls at 11 coal-fired plants. TVA will also close two units at its John Sevier plant, six units at the Widows Creek plant, and the 10 units at its Johnsonville plant by 2017. Remaining coal-fired units will require pollution control upgrades by 2020. TVA is also required to invest $290 million for its own clean energy and efficiency projects and to pay $60 million to the states of North Carolina, Alabama, Kentucky and Tennessee for similar projects. 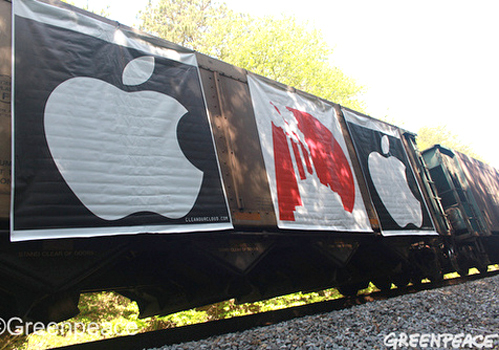 May 2012: Activists "brand" coal trains bound for Marshall plant with Apple logo. A 2011 Greenpeace report, "How Dirty is Your Data?" estimates that the $1 Billion (USD) Apple iData Center in North Carolina, expected to open in spring 2011, will consume as much as 100 MW of electricity, equivalent to the electricity usage of approximately 80,000 homes in the U.S. The surrounding energy grid has less than 5 percent clean energy, with the remaining 95 percent coming from coal and nuclear. According to the report, many data center clusters (Google, Facebook, Apple) are located in North Carolina and the US Midwest - areas where coal-powered electricity is more commonly used. ↑ 2.0 2.1 North Carolina Ranks High in Coal Plants, Global Warming Pollution, Southern Environmental Law Center, November 20, 2007. ↑ 5.0 5.1 5.2 Mineral Resources, NC Geological Survey, Division of Land Resources, accessed May 2008. ↑ "Citizens Block Shipment of Generator to Cliffside Coal Plant," Rising Tide North America, November 30, 2009. ↑ "Critics from left and right raise voices at Duke meet", Bruce Henderson, Charlotte Observer, May 6, 2011. ↑ "Coal Divestment Strategy Kicks Off in Chapel Hill," PowerShift, Sept. 15, 2011. ↑ "Greenpeace holds uptown demonstration about dangers of coal" Channel 14 Charlotte, Sept. 24, 2011. ↑ Zack Cyrus, "Dying for Clean Energy," Lumina News, Oct. 27, 2011. ↑ Andrew Dunn, "Anti-coal protesters arrested outside of Bank of America," Charlotte Observer, Nov. 16, 2011. 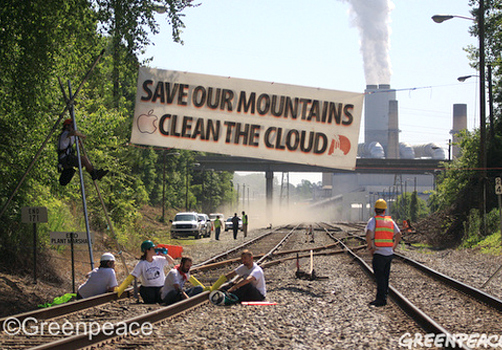 ↑ "Breaking: Activists Block Shipment of Mountain Top Removal Coal" QuitCoal.org, May 3, 2012. ↑ "Activists protest Duke Energy's annual meeting" CBS.com, May 4, 2012. ↑ "North Carolina Coal Ash Factsheet" Earthjustice, accessed December 12, 2011. ↑ 26.0 26.1 26.2 26.3 26.4 26.5 26.6 Sue Sturgis, "'Dumpsites in Disguise:' Reuse of Coal Ash Largely Unregulated by Officials" truthout, May 27, 2010. ↑ 27.0 27.1 "Unlined Landfills? : The Story of Coal Ash Waste in our Backyard" Sierra Club North Carolina Report, April 7, 2010. ↑ Sue Sturgis, "All North Carolina coal ash ponds are leaking toxic pollution to groundwater," Institute for Southern Studies, October 7, 2009. ↑ “North Carolina Coal Ash Factsheet” Earthjustice, accessed December 12, 2011. ↑ 35.0 35.1 "EPA’s Blind Spot: Hexavalent Chromium in Coal Ash" Earthjustice & Sierra Club, February 1, 2011. ↑ Municipal Power Relief Agency Subcommittee ElectriCities, Oct. 25, 2011. ↑ Gary D. Robertson, "NC lawmakers look at steep power bills, city debt," Associated Press, Oct. 23, 2011. ↑ "Duke seeks 15 pct power rate hike in North Carolina" Reuters, July 1, 2011. ↑ Bruce Henderson "Duke Energy seeks 15 percent N.C. rate hike" Charlotte Observer, July 19, 2011. ↑ Jason Y. Lee, "Citizens to Duke Energy: Shove your rate hike" Indy week, Nov. 3, 2011. ↑ Bruce Henderson, Crowd jams hearing on Duke Energy's proposed rate hike" Charlotte Observer, Oct. 12, 2011. ↑ Sally Kneidel, "Crowd overflows hearing for Duke Energy rate hike: more coal and nuclear at stake," Veggie Revolution, Oct. 12, 2011. ↑ Dawn Vaughan, "Duke Energy customers protest proposed rate hike" Durham Herald-Sun, Nov. 3, 2011. ↑ "Bills may rise as Duke pays more for coal," Charlotte Business Journal, March 13, 2009. ↑ Bruce Henderson, "Speakers oppose rate hike, coal-fired plant," Charlotte Observer, September 10, 2009. ↑ Power Plants in North Carolina, accessed May 2008. ↑ 57.0 57.1 57.2 Bruce Henderson, "Duke considers closing old coal plants" Charlotte Observer, Sep. 2, 2010. ↑ Renewable Energy and Energy Efficiency Portfolio Standard (REPS) NC Utilities Commission, 2008. ↑ "How Dirty is Your Data?" Greenpeace, 2011. ↑ Dianne Straley, "Apple Plans NC Solar Farm," Charlotte Observer, Oct. 27, 2011.